days it’s a whisper that can barely be heard. MY HEART is an exquisitely-illustrated poetry picture book about feelings. The rhythm and rhyme and accompanying illustrations will be readily appreciated by kindergarteners and pre-kindergarteners at circle times. 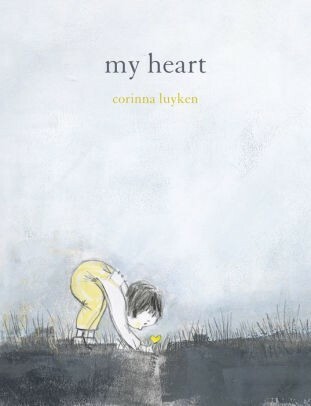 But the poet’s inspired utilization of literary devices in this satisfying read-aloud about emotions makes it equally valuable for sharing and discussing with middle graders and with tweens in a middle school language arts classroom. Luyken’s yellow/black/graphite gray illustrations were “created with a printmaking process called monotype, using water-based inks and pencil.” The images are atmospheric and intriguing, inviting long, repeated interactions. There are no bold, red, Valentine’s hearts here. Instead, on every single spread, hidden heart shapes--some large, some tiny--lie waiting to be discovered amidst the images. MY HEART is a real standout. I’ve added the poem to my children’s poetry box, and have begun working on memorizing it.